Born and raised in Sweden, Borg emigrated to the United States in 1902 and settled in California. Employed as a scene painter for the movie industry, he had his first exhibition in 1905 and was immediately recognized for his talent. 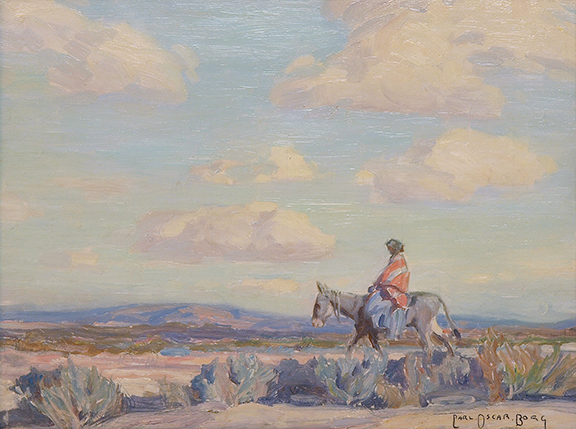 Fellow artists introduced him to the West as a subject and he began traveling and sketching throughout California and the Southwest. His reputation earned him the interest of William Randolph Hearst's mother who sponsored him for five years of study in Europe where he received awards in France in 1913 and 1914. Upon his return to the United States, Borg won the Panama-Pacific International Exposition in 1915. He lived in Santa Barbara from 1914 to 1930 and became a very good friend of Edward Borein's. The two traveled throughout the West painting Indian ceremonials and cowboy genre subjects, teaching art classes as they went. Borg also painted in Central and South America, Spain, Morocco, the Valley of the Nile, and Italy. In 1936 Borg, Millard Sheets, and Dr. Eugene Bolton of the University of California wrote and illustrated a book on the history of California titled Cross, Sword, and Gold Pan. Borg also published a book of etchings titled The Great South West that same year. His own biography was published in Sweden. His works are held by the University of California, Los Angeles County Museum of Art, Hearst Free Library, Montclair Art Museum, Seattle Art Museum, the Library of Congress, Goteborg Museum in Sweden and the Bibliotheque in Paris.